Robin Guthrie, long ago, moved on from his work with Cocteau Twins. Some fans want him to keep looking back, but frankly, I’m glad that he has continued on with his own work (albums and EPs) and numerous collaborations with Harold Budd, Eraldo Bernocchi and others as well as film soundtracks. Don’t get me wrong, I still enjoy my CT albums, and nothing is more searing, emotionally than the CT track (from their last album, Milk and Kisses) Violaine. Fortune is a personal work, putting his life, emotions and experiences into his layered, chorus-and-echo-filled guitar sound. I sense intense memories too. I find that Guthrie’s work is filled with sound-color, which is also why I am so drawn to it. My favorites include the languid ladybird, the refreshing like water in water, the tender and deeply-toned melody of perfume and youth, and and so to sleep, my little ones, which picks up where the EP Songs To Help My Children Sleep leaves off—enchanting. With each Olan Mill release, I am drawn all the more to their work. There is a subtle lag between rhythms, melodies and harmonies that gives a tidal flow, similar to some works of Ralph Vaughn Williams or Claude Debussy. Also, I’m not sure how this will be taken by some current listeners of this genre, but some of Olan Mill’s work reminds me of early to mid 1970s compositions of Evangelos Papathanassiou’s, especially the soundtrack to the Frédéric Rossif film La Fête Sauvage. This is a three track (more than 70 minute) soundtrack for a forthcoming film about Alvin Karpis (notorious bank robber and longest serving prisoner at Alcatraz Prison) by Mike Hoolboom. Karpis was released from prison in 1969, moved to Spain and wrote a memoir. He took photographs in the closing years of his life, and never shared his work with anyone until the collection was found for sale on ebay. Rutger Zuyderfelt’s response to the work is separated into three parts (black and white, color and black and white). It is a subtle guitar and electronics-based composition that gives the sense of taking a hushed and private tour through chambers of secluded memories. Released about a year ago, the eponymous A Winged Victory for the Sullen album is the work of Stars of the Lid’s Adam Wiltzie and LA composer Dustin Halloran. I didn’t realize that there was a connection between Adam and Mark Linkous (Sparklehorse), but it was ultimately that connection and colleague Francesco Donadello that brought …Winged Victory… together. Large spaces, grand pianos, string quartets and delicate woodwinds and brass are the framework for this lush and stunning album. I sometimes listen to shortwave radio, late into the night, or in the early morning, as signals and sleep drift; voices and sounds emerge and disappear. Every so often my radio will lock in on a clear signal, and for a time there are voices from foreign lands, interesting new music, field correspondents reporting, or the strange sounds of open carrier frequencies waiting for a signal to fill them. The Language Of Flowers is the enchanting (and often quirky) new album by Twigs & Yarn, and it has some parallels to late night radio listening, a mixing of familiar sounds, music and fleeting recollections. Both artists and musicians, Stephen Orsak resides in Texas, and Lauren McMurray is in Japan, and their work takes shape over the airwaves, satellites and international cables via computers and ftp servers. I didn’t discover Twigs & Yarn on my own; I have Michael Cottone of The Green Kingdom to thank for introducing me to their works. I come across new artists by exploring record label websites, visiting the few record shops that are left and (often the best method), word of mouth from musicians and friends. I don’t yet have the LP version, but the CD is packaged in a letter-pressed hand decorated collage (each one is slightly different). The album opens with the mysteriously diaphanous Laverne, which shimmers like filtered sound-light on a bright morning, then passes quickly into the gentle swaying of Static Rowing. The fourth track Conscious Strings is both the clear reality of a solo acoustic guitar, combined with the meandering voices of a daydream. Some tracks seem to blend together as observations shift, and there is peaceful warmth in the sounds of a given day, whether inward looking as in Mermaid Wetness (with ingeniously repeated cadenced sound-samples) or outward as in the strangely discordant An Honest Moment which merges into street sounds, bells, voices, and then into a tranquil music box and electric guitar reflection in Rosy Cheeked Pumpkin reminiscent of Daniel Lanois’ pedal steel work on his album here is what is. Bristle Of Mundane is an unexpected contrast, which opens with a heavily-distorted music box, eventually settling into gentle waves. The experience of late night radio listening is present in Flowers Thirsty, tuning in and out from pop-music radio samples to a distant ebb and flow of music and whispers, the mind drifts late into the night, until being awakened by the radio-alarm (this is my favorite piece on the album, mysterious and great keyboard sounds). The gentle pulsing organ of Marigold Ride contains a soft repeated vocal, flowing into acoustic guitar of Strings Of Complacency (sounding a bit like some recent solo guitar work of Ant Phillips combined with light treatments from Eno’s Julie With from the album Before And After Science). Learning To Glisten is the postlude to the album, the purest of all the tracks, with little sonic movement, and is a soothing close. The Language of Flowers is like rotating a radio tuning knob late at night, or peering into a window overlooking a secret garden, or ephemeral visions in a dream. It’s an assemblage of existence all around, from the broadest landscapes down to the tiniest whispers, and even memories of childhood games as in the gently spirited and delightfully melodic third track, If I Were An Artery. The music, field recordings, samples and instrumentation are assembled with an idiosyncratic aplomb that yield a very cohesive and soothing quality, like a less energetic, more contemplative version of works by The Books combined with gossamers of the dearly departed Sparklehorse. So, it makes complete sense that Nick Zammuto (ex-Book) mastered this album; a symbiotic chemistry. Note: Double LP version has 3 sides with the 11 tracks of the CD and a 4th side with 4 additional tracks, “Guess I’m dumb” and three remixes of selected tracks noted above. Kurt Wagner is a humble and interesting character (and from what I have read) a former flooring contractor, now artist, painter, musician, songwriter…and…human, with all the flaws, working through life in his marvelous songwriting. I came to Lambchop’s work relatively late (through a lateral association with Vic Chesnutt, Mark Linkous and F. M. Cornog’s works) about 5 years ago when I first heard “The Daily Growl” from the 2002 album “Is a Woman”. I was immediately rapt with the music, instrumentation and the stream-of-consciousness lyrics (coming from a man who sounds like a reluctant singer). In that song alone, I felt and heard a deep inner beauty and from there I immediately acquired as many of Lambchop’s recordings I could get my hands on, back to their first in 1994 “I Hope You’re Sitting Down/Jack’s Tulips”. At times, Wagner’s song lyrics seem to have little relation to the apparent subject matter of a given song, or they form the basis for the emotion being expressed (with distracted interjections), and at times the lyrics form a connective thread for the music (like the song “Paperback Bible” from the 2006 album “Damaged”, which I have read is a transcript from a local Nashville radio station broadcast set to music). 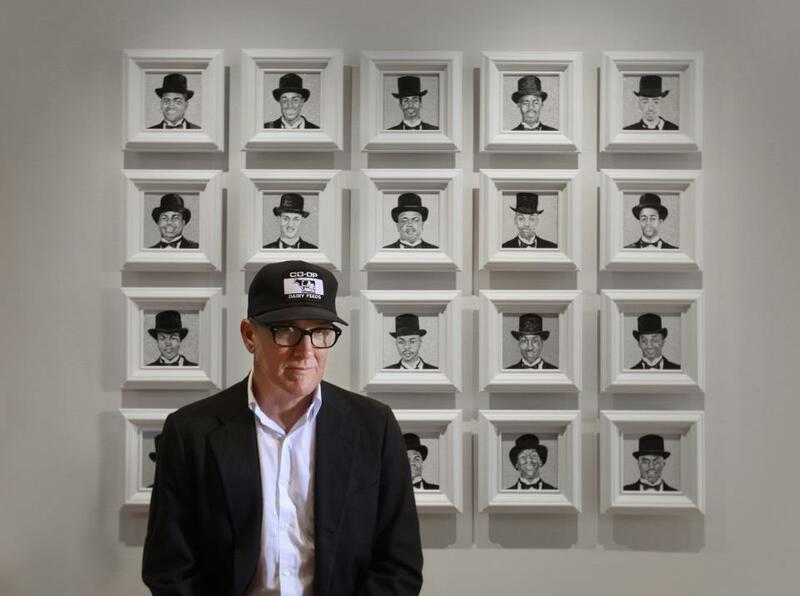 Lambchop’s music is neither country nor folk, nor is it rock or alternative. It’s rather indescribable, yet it is often introspective and has a strong sense of a given moment, emotion or place. “Mr. 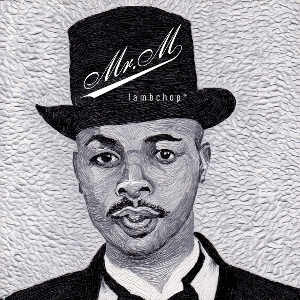 M” is the eleventh studio album by Lambchop (a collective of musicians centered on Kurt Wagner). The band is a core of familiar players: Scott Martin (drums), Matt Swanson (bass), Ryan Norris (guitar and organ), William Tyler (guitar) with guests (original co-founder) Jonathan Marx (credited with “noises”), Cortney Tidwell (vocals and collaborator on their KORT project) and others (see link to Merge Records above). Apparently, for a time Wagner considered not recording again until he was convinced by friends (including producer Mark Nevers) to go back into the studio. Wagner was painting and doing other things prior to writing the songs and working on the recording (the album was recorded from 2009 to 2011). Wagner’s paintings form the basis for the album’s artwork, from a series of black and white (heavy brush stroke) paintings entitled “Beautillion Militaire 2000”. “Mr. M”, while another in the canon of rather quiet and contemplative works by Lambchop, is an appropriate and loving tribute to Vic Chesnutt. In this work the lyrics vary from literal heartbreak to ironic wordplay and at times are layered with references to song arrangements having an effect (in real time) on Wagner, random thoughts, daily routines and things as mundane (yet real) as a coffee maker or trash on the motorway. The instrumental “Gar” is a gorgeous and timeless interlude at the heart of the album, beautifully arranged with strings, woodwinds and Cortney Tidwell’s harmonic layered vocals. “The Good Life” is reminiscent of Johnny Cash’s works of self-examination. In some ways this album has a similar spirit of introspection and sound to Nick Drake’s “Bryter Layter”—another album of observations, hope, dreams and deep reflections. Some may say that “Mr. M” is rather sleepy, but I think it’s a soul-cleansing meditation with many layers of symbolism to be discovered and understood as one listens more. The strings and woodwinds arrangements are just right (similar to Robert Kirby’s on Drake’s “Bryter Layter”). I am thankful that Kurt Wagner and Lambchop decided to make music again.